2019 TVS Wego was recently spotted testing under heavy camouflage. Here are 5 things you need to know about the upcoming 2019 version of the 110cc TVS scooter. Due to the high success rate of TVS Jupiter and Ntorq, TVS has established its dominance in the scooter segment. One of the very first scooters, TVS Scooty, redefined the modern gearless scooter scenario. Over the years, most of their scooters have been successful, including Wego. After Jupiter and Ntorq, the demand for Wego has fallen down severely. Now, 2019 TVS Wego has been spotted under camouflage. It might be testing the new BS-6 engine and its Synchronized Braking System. Here, we state the 5 things that you need to know about the 2019 iteration. 1. As we all know, stricter emission norms are kicking in from April 2020. For all the vehicles to survive in the market, conversion to BS-6 engines is mandatory. So, a lot of automobile brands have started testing their models to meet the norms. Now, the 2019 TVS Wego might also be running with a new BS-VI engine underneath. 2. For braking purposes, Wego uses a Syncronized Braking System with an optional 220 mm disc brake. For two-wheelers under 125cc, a centralized braking system is required. So, there are chances that 2019 TVS Wego might get a revised and improved braking system. 3. Design wise, it recently got some visual updates. So, we don’t think that the 2019 TVS Wego will get any design changes. It might get some decals or new colour options. Although it already comes in dual-paint option, there might be minor additions to it. As seen in the spy pic, the upcoming Wego will carry over the same tall-design, black alloy wheels, a rather beefy body and same set of lights. 4. For engine purposes, it will continue with the 109.7cc engine. Jupiter also uses the same engine. It makes out 8 BHP and 8.4 Nm peak torque. For transmission, it gets a CVTi gearbox. It delivers a claimed mileage of 60 kmpl and achieves a top speed of 84 km/hr. It uses telescopic suspension in the front and Unit Swing Hydraulic at the back. The fuel capacity of the scooter is 5 litres, delivering a riding range of around 300 kmpl. 5. Lastly, the features onboard the 2019 TVS Wego ill include fully-digital speedometer, full-LED headlamps, LED tail lamp, dual side handle lock, external fuel filler cap, self-illuminating key lock glow, USB Mobile charger, Parking brake and Econometer. It might also use a boot lamp and more features, which do not come in the current Wego. The prices of Wego start off at Rs 52,127 going up to Rs 53,027 (ex-showroom prices). 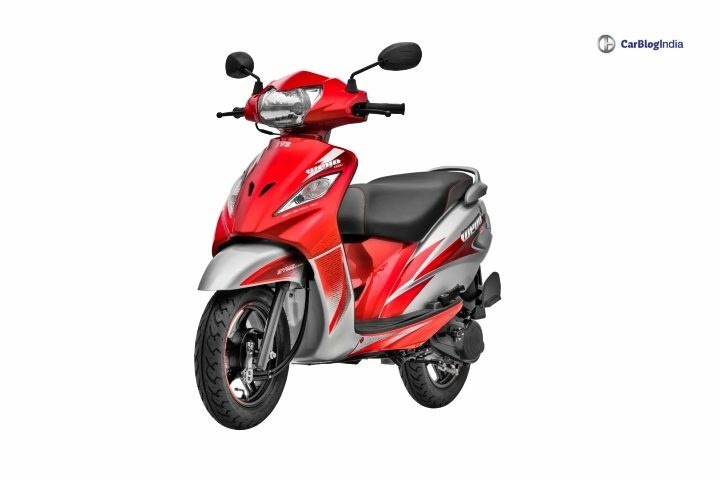 At this price, it takes on the likes of Honda Activa, Suzuki Let’s, Yamaha Fascino and Hero Duet. Currently, it garners over 3000 units a month, making it the one of the least selling two-wheeler of TVS. Even Apache RTR 160 and 200 garner more sales than Wego.